Vantage Technology Consulting Group is pleased to announce our role in a transformative, technology-rich learning environment on the campus of Washington State University in Pullman, Washington. In collaboration with Clark Construction and ZGF Architects, Vantage is designing comprehensive, cutting-edge teaching and learning systems for the new Digital Classroom Building. 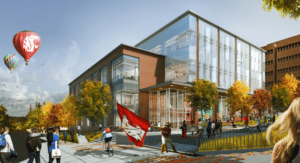 The striking new 80,000 square foot facility will serve as a gateway, showcase venue, and catalyst for WSU’s campus-wide initiative to address the tremendous advances that have been made in understanding the way students learn in the 21st century. Among the innovations are an in-the-round active learning lecture hall with circular, blended video displays viewable from any seat, two large flat-floor collaborative active learning classrooms, multiple flexible classrooms, and a variety of dedicated, pedagogy-specific spaces. In addition to café and atrium/event space amenities typical of a modern student center, the design includes purpose-built areas such as maker space/collaboration; open, informal, problem-based, faculty innovation and student skills learning studios. Vantage is working closely with the WSU administration, faculty and students to provide robust designs that allow flexibility in teaching modalities, address the way students learn, and to create learning across multiple disciplines. In support of the campus master plan, the building is expected to energize and enable students and faculty, provide support for students and faculty to learn new technologies, and create a nexus between the adjacent academic and housing facilities. Occupancy is scheduled for the first quarter of 2018.